Here are the eGalleys we’re reading and recommending this month! 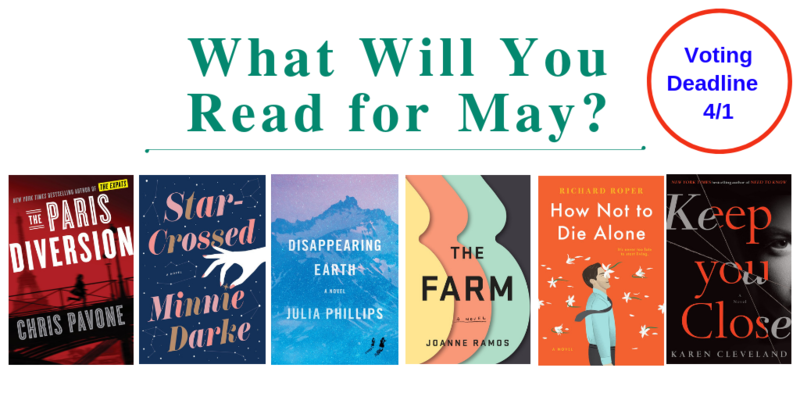 Click to request eGalleys of our favorite May titles, and if you love the books, please consider nominating them for LibraryReads! Remember, voting for the May list ends on April 1st. Click to Request eGalleys of These and More May Titles. Nestled in New York’s Hudson Valley is a luxury retreat boasting every amenity—and all of it for free. In fact, you’re paid big money to stay here. The catch? For nine months, you are cut off from your former life while you dedicate yourself to the task of producing the perfect baby. Spellbinding, moving—evoking a fascinating region on the other side of the world—this suspenseful and haunting story announces the debut of a profoundly gifted writer. A highly adorable and addictive love story that explores whether the stars can or should be a guide through life and what happens when one woman tries to give the stars a little help. She knows her teenage son isn’t perfect. But when the FBI starts investigating the kid she thought she knew, will she jeopardize her own career at the Bureau to keep her child safe? From the New York Times bestselling author of Need to Know. Kate Moore from The Expats is back in the latest pulse-pounding thriller from New York Times bestselling author Chris Pavone, set in Paris over the course of one day. For more information about the program, or to learn how to vote for your favorite upcoming books, visit LibraryReads.org. And, don’t forget, voting for the May LibraryReads list ends 4/1/19!